Competitors on the stage yelled warning and commanding shouts at each other while audience members clamoured in awe after each narrow escape and kill. 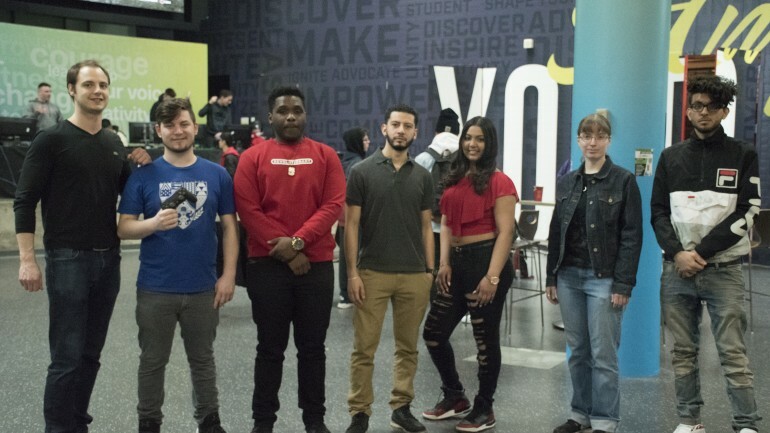 At the same time, a team of Humber’s business management students were in their own fog of war at the Last Lyfe tournament on April 7. As Ristics Student Enterprises Inc., they fought and overcame challenges as a team throughout the semester and at their Call of Duty: WWII and FIFA tournament. The 12-hour tournament — sponsored by We Got Game! and Toronto Game Devs — was held at the IGNITE Student Centre. It brought together students interested in the world of eSports and gaming programming. We Got Game! hosts gaming events at colleges and universities, while Toronto Game Devs provides a network of local game creators. Christian Rinomato, the president of Ristics, initially promoted the tournament using an eSports website, then used Instagram to tell stories and give updates. Despite the odds against Rinomato and his team because of the five-week faculty strike last term that limited them on time, they still managed to pull in a great turnout. “The strike had a bit of an impact, and just trying to decide on the actual business itself was difficult,” Rinomato said. He was glad Humber’s business management program allowed everyone to grow and achieve their full potential, and he was proud of his team and grateful for the opportunity. Peter Sirois, a professor of business management at Humber, couldn’t be more proud of what his students achieved. “The intention of the program was to give students a one semester experience into what real entrepreneurship is like,” Sirois said. “It’s a really a good learning experience. There’s not a lot of text book, not a lot of theory. It’s about applying what they’ve learned over the previous two years,” he said. “We’re going to teach you how to run a business, but we’re also gonna give you an opportunity, if you do well learning those theories, to actually run a business and maybe even make more money that it cost you to take the course,” Sirois said. Prospective Humber students who competed in the tournament expressed interest in coming to the college as well due to the hands-on opportunities and events the school has to offer. Competitor Christian Toscano was one of them. He was just sitting at his house and playing on his PS4 when he got an Instagram notification from Ristics. He then immediately formed and registered his team to play in the tournament. “It’s awesome. It’s super, super close to like where I live. I live like not even 10 minutes away. It’s awesome that Humber is supporting the gaming community,” he said. Aside from Call of Duty: WWII, Toscano is really interested in the Fighting Game Community (FGC). He hopes to participate in other Call of Duty events in the future, as well as Super Smash Bros. and Mortal Kombat. Chhavik “Crayon” Sangar from Utilize Gaming was also another competitor. His team told him about the tournament three weeks beforehand, and he was impressed by the tournament. Sangar is thinking about going into an engineering program at Humber, and the events the colleges host are a big part of his decision-making process. “I didn’t know where Humber was before this, but I’m gonna come here more if they keep hosting events. And honestly, this event’s run pretty good,” he said. While players duked it out with one another, watching from a far corner were Adam “Jenks” Ralph and Jake “Sprewell” Renshaw, professional players from Northern Express, a Canadian eSports team. The team has been attending major league gaming Local Area Network events this year to both compete and scout out new talent. To Renshaw, getting to know a potential teammate first is also important. “It’s nice going in-person where you can actually make that face-to-face contact with someone, because the amount of time you’re gonna spend travelling with that person and paying with them — it’s gotta be someone you click with,” he said. To both of them, an event like Ristic’s Last Lyfe is also a great networking opportunity. “It’s, you know, doing things like this. These students going to tournaments like this is really good, you know, as small as an event may be, you never know the kinda connections you can make. We made a similar connection,” Ralph said. For Ristics, their tournament was learning experience in connecting business and eSports. “We decided to do a video game tournament, because we thought it would become a profitable business. So far, we’re really enjoying the experience, learning a lot along the way. And everyone seems to be having a great time, so I’m really happy,” Rinomato said.